In Hartford, Conn., an innovative program is teaching students from varied backgrounds about their local river ways. In the water and in the lab, they're getting excited about earth science. San Francisco Bay Area teachers and students are also connecting with their watersheds — through SF-ROCKS, a program aimed at encouraging ethnic minority participation in the geosciences. Lisa D. White et al. 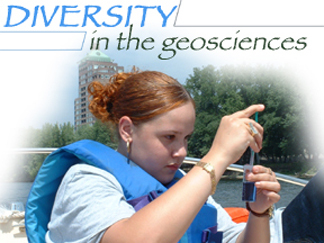 In the geosciences, a community-wide conversation is vital to recruiting and retaining a diverse population. Taking a trip? Visit Travels in Geology to find geologically significant places to visit. Some young geoscientists strut their stuff at this year's International Science and Engineering Fair, but the earth sciences as a whole remain sorely underrepresented  a challenge we must all help meet. Over the past 16 years, the tactics of those opposed to teaching evolution in the nation's schools have changed. Their goal, however, has not. Manned Space Exploration: Should We Give it Up? Seven months after the Columbia tragedy, reflection continues on the true value of sending people into space. Photo montage: High school students discuss their posters at a special session at the 2002 meeting of the American Geophysical Union (left photo, by Harvey Leifert, AGU); students in Hartford, Conn., connect with their local watersheds as part of hands-on program to enhance minority participation in the geosciences (two right photos and background, courtesy of Suzanne OConnell). Read story on the watershed program.